As you can see, there is now a new icon button (with a lock) which will allow you to login to your account. 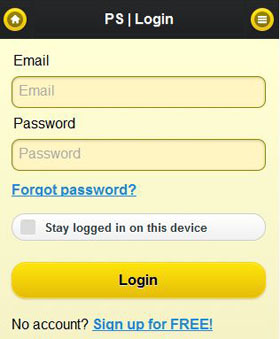 To create a new account, touch “Sign up for FREE” at the bottom of the login screen as shown below and follow the simple instructions. If you already have an account, login by entering your email and password. If you cannot remember your password, touch “Forgot password” and you will receive an email with a link to reset your password. If you would like to remain logged in, touch the box to the left of the “Stay logged in” and remain logged in for 30 days. Another upgrade with this version is the “Top Party Signs” list shown below. 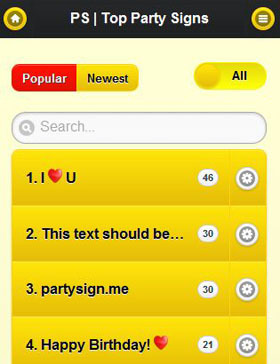 This screen will show the most popular messages that are being used by you and everyone else. Select the switch at the upper right to either “All” or “Mine”. “All” shows signs created by everyone. “Mine” will only show signs created by you. To find a specific sign, type in the box labeled “Search” to only see matching signs. Touch the gear on the right side of each of the signs in the list to see more about the sign. If you are the creator of that sign, you can also edit it or delete it. Note that editing it will allow you to modify then create a new sign but does not actually edit the existing sign. If you would like to see other features added, please post your comments here.